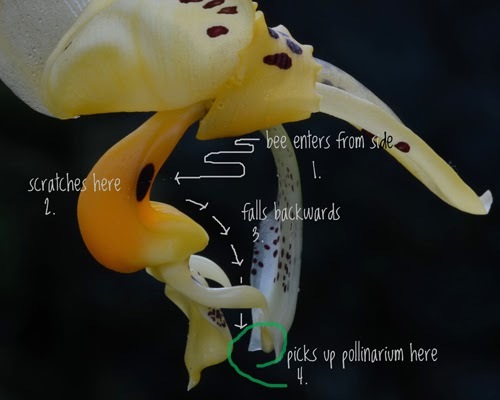 Now that you've gotten a handle on how a Stanhopea flower is constructed, you're probably wondering, How does it work? 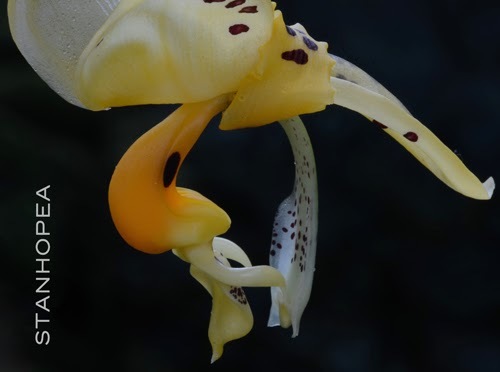 Stanhopea is one of a group of orchids (including about two dozen genera in the subtribe Stanhopeinae) native to the tropical Americas which are pollinated by male euglossine bees. Their large waxy flowers offer no food or reward for bees other than powerful fragrances containing compounds like 1, 8-cineole, methyl salicylate, benzylaldehyde and methyl benzoate. Each Stanhopea species has a fairly unique fragrance mixture. Individual plants of a particular species are often widely scattered in the forest. 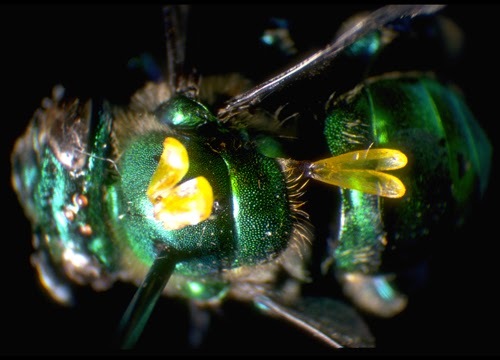 Euglossine bees are large tropical bumblebee relatives, often iridescent blue, green or bronze. They are fast fliers, capable of covering long distances in search of a particular fragrance. They feed on nectar from a variety of tubular flowers. The males also gather scent by scratching flowers and mopping up the liquid fragrance with the feathery brushes on their front tarsi. They transfer the liquid to their hind legs and carry it in their inflated hind tibiae. The fragrance is believed to play some role in mating. Stanhopeas like S. jenischinana have ‘fall-through flowers.’ Their flowers point downward. The bee flies directly to the source of the scent at the center of the flower, entering through the side and alighting on the base of the lip (the hypochile). The bee falls either when he loses his grip on the slippery surface of the lip, or when he attempts to launch into the air. He then falls backwards with his back tracing the length of the column. The horns on either side of the flower’s lip channel him past the tip of the column, where the pollinarium with its adhesive disk is deposited on his back. At a subsequent flower the pollina are pressed against the sticky stigmatic surface as the bee falls through the flower.